BEIJING, Nov. 14 (Xinhua) -- President Xi Jinping has highlighted the significance and urgency of pushing forward reform on military policies and institutions to build a socialist system of military policy and institution with Chinese characteristics. Xi, also general secretary of the Communist Party of China (CPC) Central Committee, chairman of the Central Military Commission (CMC) and head of a CMC leading group for deepening reform on national defense and the armed forces, addressed a CMC meeting on the reform of policies and institutions held in Beijing on Tuesday and Wednesday. Xi called for consensus, firm confidence, concerted action and effective implementation to carry out the reform. He stressed that a systematic and profound reform is urgently needed to address deeply-rooted problems in military policies and institutions, fully release the efficacy of national defense and military reforms, open a new ground for building strong armed forces, and seize the initiative in military competition and warfare. 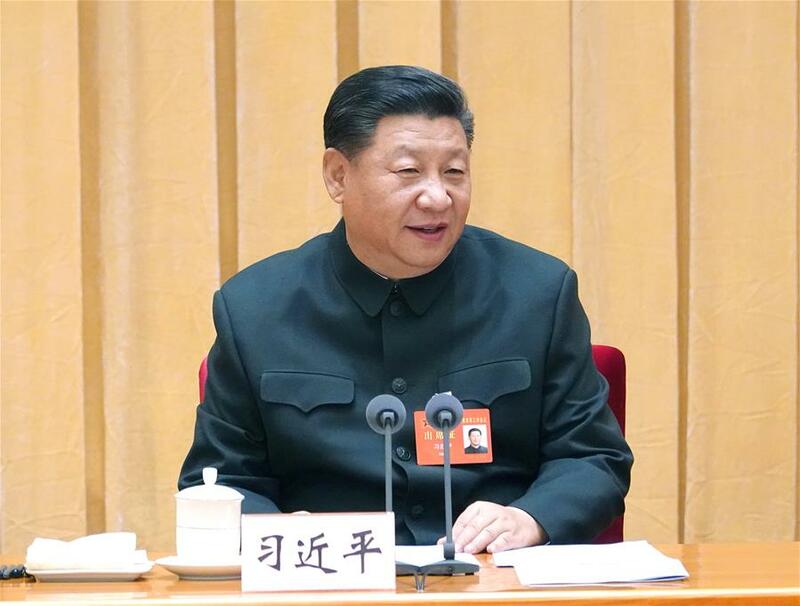 The reform should be guided by the Thought on Socialism with Chinese Characteristics for a New Era and the spirit of the 19th CPC National Congress, ensure the Party's absolute leadership over the military, aim for combat effectiveness, and enhance the motivation, initiative and creativity of service personnel, Xi said. Xi stressed safeguarding the authority of the CPC Central Committee and its centralized, unified leadership and ensuring the Party's absolute leadership over the military, while deepening reform on the institution of Party building in the military. Xi ordered efforts to innovate the policies and institutions on the application of military strength, adapt to the needs of national security strategy and focus on how to win when it is called on. He called for restructuring of policies and institutions on military strength building, strengthening institutions and system-designing for military human resources, and focusing on combat, innovation and military-civilian integration. Xi also called for reform on policies and institutions of military management, including establishing a system to manage military spending and further reform on the military judicial system, in order to enhance the efficiency of the whole military system. "Implementing the decisions by the CPC Central Committee and the CMC on the reform is a major political responsibility," Xi said, ordering the military to strengthen their sense of duty, as well as carefully and orderly implement the decisions. They should fully recognize and grasp the significance of the reform, understand, support and comply with the reform, he said. Noting that pushing forward the reform is the common mission of both military and civilian authorities, Xi asked both central and state organs and local Party committees and governments to support the military reforms.